I love it when aikidoka from other dojo come play with us. It’s fun to meet people from all over the world, and to learn a little about how things are done in other places. I don’t travel a lot, but if I did I’d sure want to visit other dojo, meet folks there, and get my Aikido fix! Most dojo welcome visitors of any affiliation. Knowing the affiliation or lineage can be interesting, though. The dojo where I train for instance, Aikido of San Diego, is affiliated with Aikikai, through the California Aikido Association (CAA), under Division 3, headed by Robert Nadeau Shihan. Belt colors, if they are used, can help clue you in to the level of your training partners. We have a few belt colors (6 & 5 = white, 4 & 3 = blue, 2 & 1 = brown), and only yudansha wear hakama. In some schools, belts are white for all kyu ranks. In others, everyone wears hakama. So don’t assume that people wearing white belts are newbies, or that those wearing hakama are yudansha. At every dojo where I’ve trained, and in the seminars I’ve been to, people don’t line up in any particular order. But at some dojo, people do line up according to rank, so keep your eyes open to figure out where you should sit. We usually don’t clap when we bow in. In some schools, the instructor leads bows with two claps, or sometimes four. Always follow the instructor’s lead. In many schools, everybody trains with everybody else, and lower-ranked students are encouraged to approach senior students and ask them to train. But at some dojo students train with others near their own rank. In some schools lower-ranked students do not approach seniors, they wait to be asked. At the dojo where I train, we usually change partners throughout the class. At some dojo you stick with the same partner through the whole class. In some places you try a technique two times, and then switch with our partner, while in others each partner does the technique four times before switching. In many dojo it is OK to unobtrusively step off the mat for water (we often keep a water bottle near the edge of the mat), or to go to the bathroom if you must. Do this during training times, never when the instructor is demonstrating a technique or speaking. At some dojo leaving the mat for any reason is strongly discouraged, and you should ask first (don’t just duck out). If you think you might need to excuse yourself during class, ask a local student how things are done, or just watch the others who regularly train there. Also notice (or ask) how you should return. 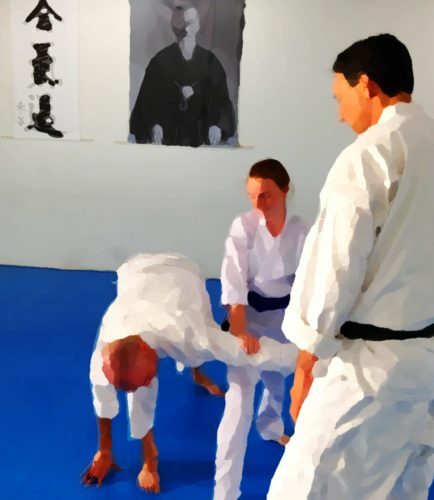 We bow in without interrupting the class and return to training, and a standing bow is OK. At some dojo you would wait, in seiza, at the edge of the mat for the instructor to allow you back into the class, and do a seated bow when you are acknowledged.